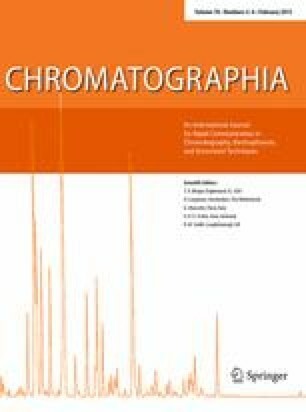 A simple and rapid methyl esterification technique for edible oils and a high-throughput procedure for the separation and quantification of fatty acid methyl esters including cis/trans isomers by fast GC using a highly polar ionic liquid column have been established. The developed method was successfully applied to the determination of trans fatty acid contents in commercially available edible oils, such as margarine, fat spread, shortening, olive oil, rapeseed oil, salad oil, and sesame oil. Combining the developed methyl esterification and fast GC techniques reduced the time required for the analysis of one edible oil specimen to less than 30 min; thus, the analysis time was shortened substantially to less than one-third that required in the existing official methods such as those of the American Oil Chemists’ Society and Japanese Oil Chemists’ Society. The contents determined by the developed method agreed with those determined by the existing official methods, thus confirming the reliability of the fast GC method. This work was supported by Grants-in-Aid for Young Scientists (B24780138) from the Japan Society for the Promotion of Science (JSPS).